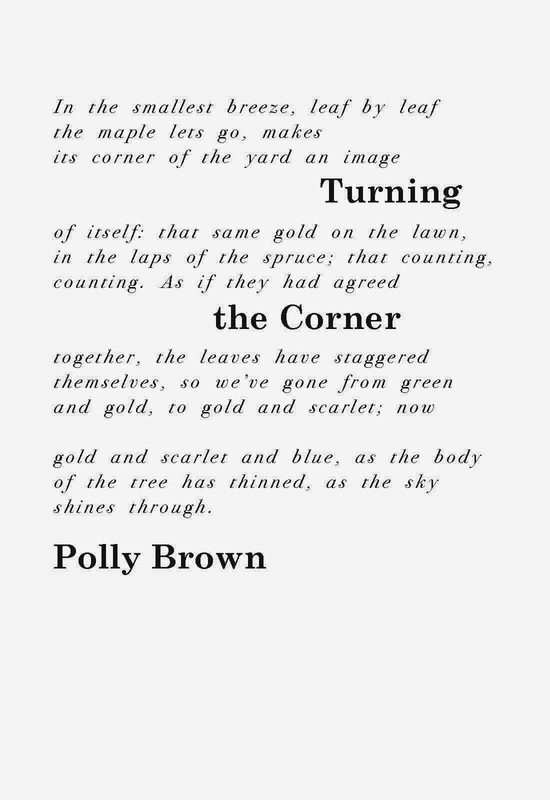 Polly Brown lives on a hillside in central Massachusetts, writes a blog about progressive education at ayeartothinkitover.com and has two poetry chapbooks in print: Blue Heron Stone (Every Other Thursday Press), and Each Thing Torn From Any of Us (Finishing Line). Recent poems have appeared, or will soon, in Clade Song, Sandy River Review, Soundings East, and Turtle Island Quarterly. Meanwhile, a manuscript called What There Is, which moves from geology to botany to zoology to human artifacts, will soon go scouting for publishers yet again. As the tree’s canopy has thinned, so has the body of the poem: there’s an extra space between each word, and the text as a whole has been kerned open to let the white page really show through. Bodoni’s italic rolls evenly, like a few remaining leaves in the wind. Century Schoolbook is firm and upright, especially in boldface, providing what will stay through the winter: the trunk and the ground.